Situated on the oceanside of Baltimore Ave., the Flamingo Motel is just steps from the sands and waters of the Atlantic Ocean. We are within walking distance to Ocean City's famous boardwalk, as well as restaurants, shops, amusements and nightlife. Our oceanside 3-building complex offers 112 comfortable units ranging from rooms and efficiencies to kitchenettes and suites, most with ocean views. Each spacious air-conditioned room features a private balcony, refrigerator, microwave, phone and cable TV with HBO and Disney. 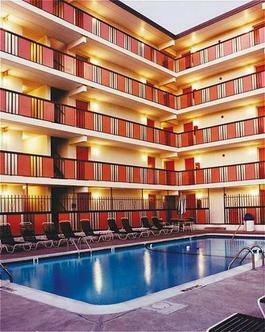 Hotel ammenities include both indoor and outdoor swimming pools, sundeck and shower room for after checkout use.